But will our next mayor keep her around? Such is the situation in which Erika Shields, appointed to the top cop job in December by Mayor Kasim Reed, finds herself. 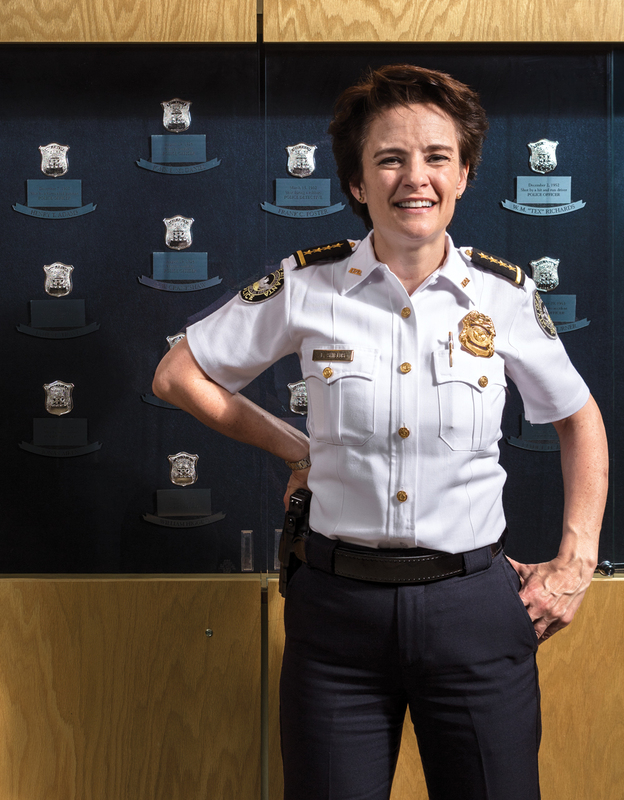 In the waning months of a lame duck mayor’s term, a time when other city officials are packing their boxes or polishing their resumes, Shields, the APD’s first openly gay chief and the second woman to lead the force, is chipping away at an ambitious agenda for the 1,850-officer department—one that could please both policing reform advocates and cops. If her plans work, the city could see a downturn in gun violence, spend less money fighting low-level crimes, and deter juvenile offenders. But that long to-do list could take years to accomplish. And Shields’s job security expires in January, when Atlanta’s new mayor takes office. It’s anyone’s guess who will win the job—and whether they will follow a 40-year tradition and appoint a new chief. Shields says she is focused on her agenda. Although Shields’s professional life began as a stockbroker in Boston, there were early hints that she had a future in law enforcement. Shields used to fingerprint siblings she caught sneaking in her room, her mother, Audrey, says. While visiting friends in Atlanta in 1994, she fell in love with the city’s weather, hospitality, and diversity. She moved here the same year, quit finance, and enrolled in the APD’s police academy. Her first assignment was as a beat and plainclothes officer on the southside of Atlanta during the tail end of the crack epidemic—a “Wild West” experience, Shields says—where she learned something new every day. The five-foot-four-inch Shields, still in her 20s, was able to avoid physical confrontation by talking suspects into the back of her squad car. Before her career in law enforcement, Shields worked as a stockbroker in Boston. Over the next 20 years, Shields climbed the ranks, working with or leading APD divisions including internal affairs, narcotics, and the Video Integration Center, the department’s downtown panopticon where cops monitor nearly 8,000 public and private surveillance cameras. In those jobs, according to fellow cops and even watchdogs, she proved herself to be a details-oriented policy wonk who could also think big, someone who believed in the rules of policing but also knew when to revise them. After a controversial paramilitary unit was hit with lawsuits alleging stop-and-frisk violations, says former Police Chief George Turner, Shields was the first member of his top brass to step up and suggest he dismantle the force. 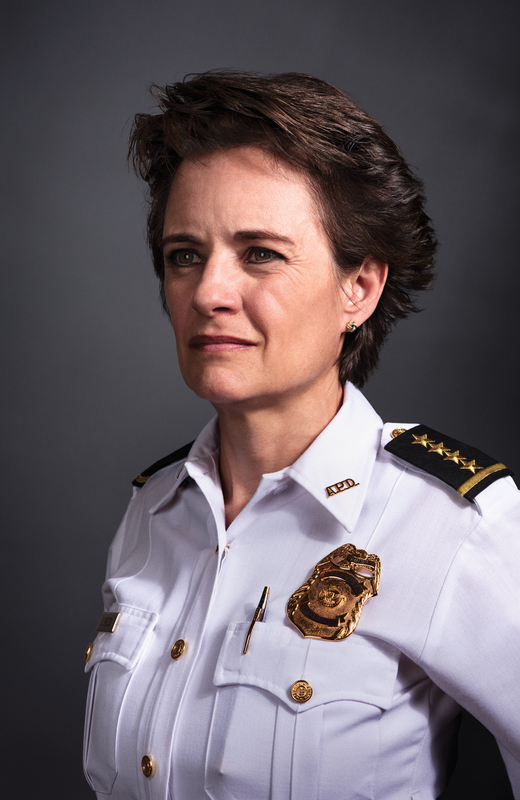 Shields was overseeing 911 officers and zone precincts when the mayor picked her to succeed Turner, saying she “has the foundation to be one of the best and most qualified leaders in the country.” She joined an exclusive club: Of the country’s 50 largest police departments, only five are led by women. Turner drove down crime partly by leaning on broken-windows and data-driven policing as he led the APD during the start of the intown boom. But critics say his—and Reed’s—focus on statistics and metrics could distract attention from making safer streets. “The job description is not to make as many arrests as possible,” says Xochitl Bervera of the Racial Justice Action Center, a social justice advocacy group. “It’s to protect the community.” Now that crime has declined, Shields, who once served as Turner’s chief of staff and calls him a friend, has some room to experiment with his playbook. Those progressive ideas deserve a shot, says Vince Champion of the police union, but “none of that matters if you don’t have the manpower to work the streets.” Despite a small pay bump last year for midcareer officers, a long-running effort to meet and maintain Reed’s goal of increasing the number of officers to 2,000 has fallen short. Two years ago the police union estimated that 45 percent of cops hired between 2005 and 2013 had left the department—some for suburban forces with better salaries, newer equipment, and less stress. Shields wants to fill those vacancies, increase salaries, and improve benefits—and has been presenting the mayoral candidates with a detailed plan to accomplish just that.